This ultra-portable charger sports 150W power and charges up to 6 LiXX cells. But looks aside, is this a good charger to take with you to the field? Find out in our review! When Banggood and Hobbyking both offer preorders for the same product at the same time, you know something’s up. 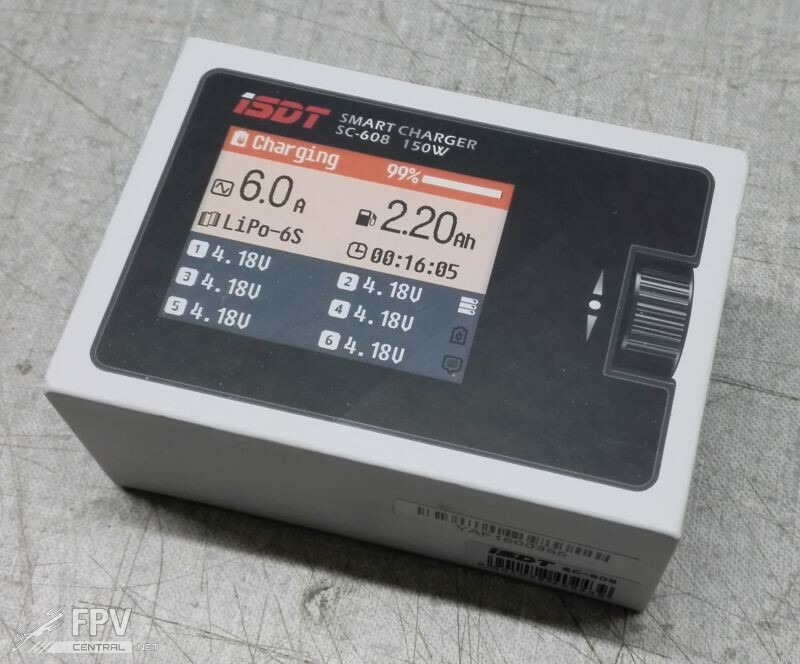 We got lucky and got one of the first shipments of this neat looking little charger, and when the postman delivered the package we didn’t believe our eyes. This thing is absolutely tiny, comes in a cute little box, but feels absolutely rock solid. 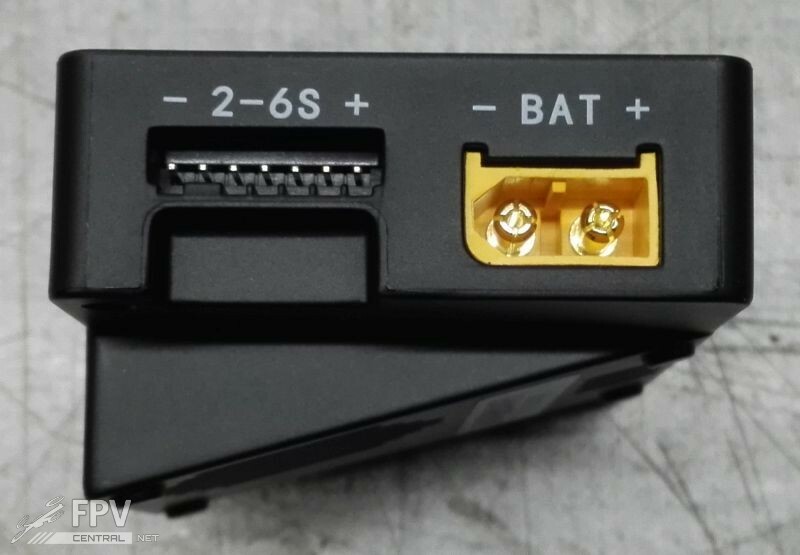 Interestingly there’s XT-60 connectors for both the incoming power AND the battery to charge. The balance connector has universal cutouts so you can plug in pretty much any type. The back features a sloped protrution that acts as a stand, and it also ensures sufficient airflow for the fan which, we should note, comes on only sparingly, mostly when you discharge a battery, or if you charge with the full 150 Watts. So how small is it? Just look at it! Here’s our trusty Accucell-6 which has been in use for a decade, as well as our current favorite X-100 Touchscreen Charger. 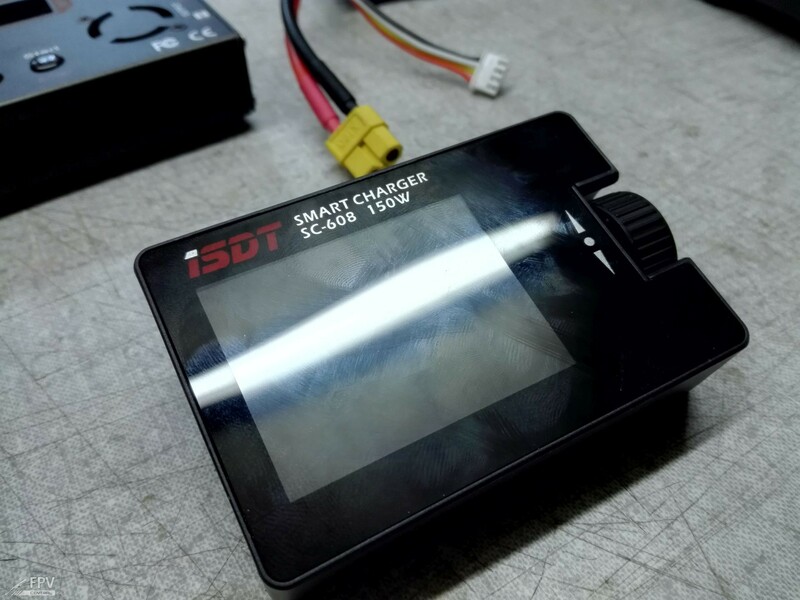 While we still absolutely love the user friendly touch operation on that thing, the iSDT mini charger is simply smaller and more rugged. Contrary to what you might think, it’s not touch operated. The only user control is a clicky scroll wheel. This input device feels very solid, with a well defined ratcheted operation, and a satisfying click when pressed in. There’s no weirdness going on, every indentation when rotating scrolls whatever menu you operate by one point. There’s a little boot screen when you plug it in, with the device actually performing tests on the buzzer, the electronics and the fan. Overall it only takes about 4 seconds from plugging in to being able to use the charger, which is absolutely acceptable. 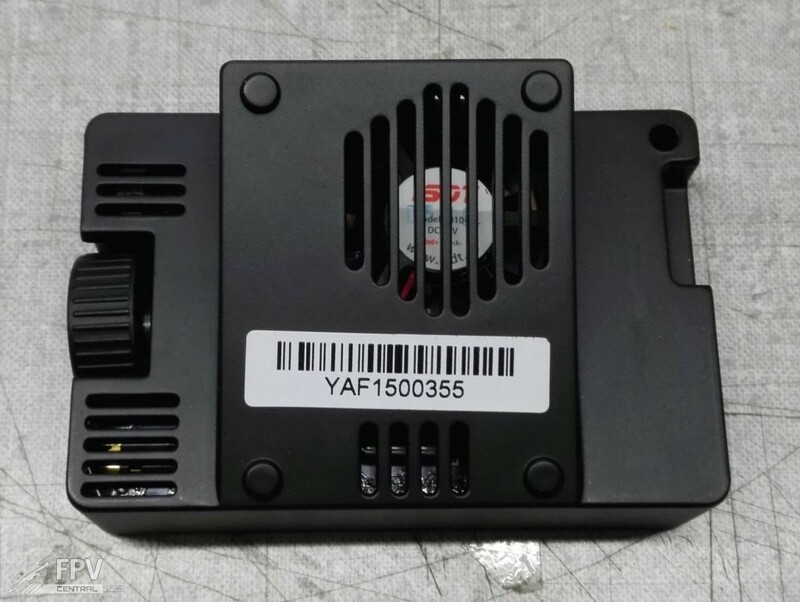 Here you can limit the max input power draw from 50 to 160W – useful if your power supply can’t handle the full load. And yes, it’s actually 160W because putting out 150W on the charge port means you’ll draw more than that from your supply. 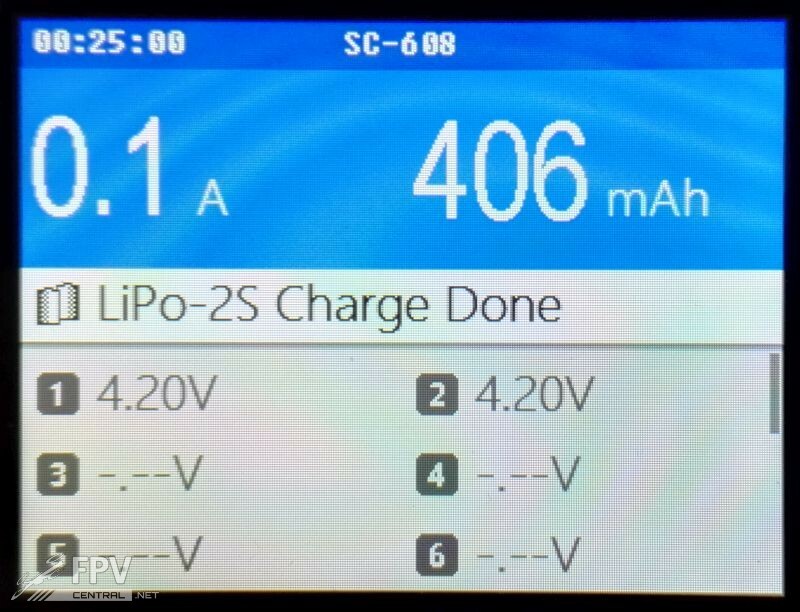 There’s also a minimum voltage limiter – useful for when you use another LiPo as power source, as well as controls for backlight (low/med/high) and buzzer (low/med/high and OFF thankfully). Supported languages are just Chinese and English however. 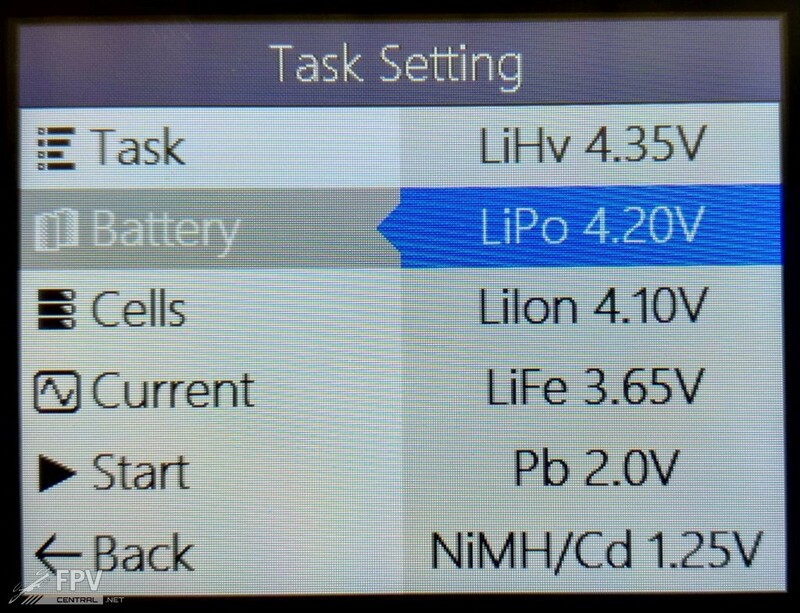 Do a short press and you get to a very simple and easy to understand menu that lets you set up the type of task you want to do (Charge/Discharge/Store), the battery type, the cell count and the charge current. Pressing on Start gets things going. The color coding is excellent: The top status bar is grey when idle, orange when charging, a recently finished (fast)charge is indicated with a green status bar, and when you leave the charger for a bit after it finishes, it’ll keep balancing the battery after which the color changes to blue. This is great because if you have several of this charger working next to each other, it’s easy to tell which one just finished charging and which ones have been done for a while. Little things like these tell just how much the developers focused on what people actually need in the field. 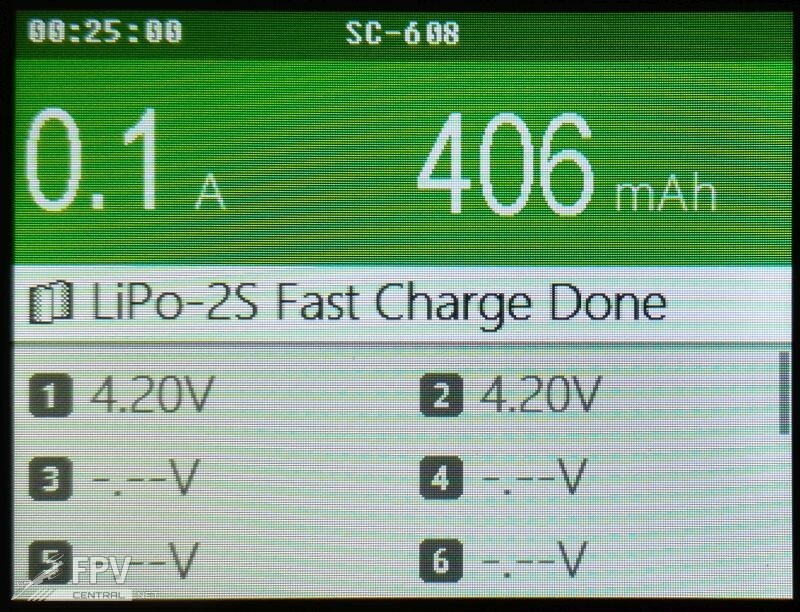 During charging, you can scroll the wheel to get voltage info for your power source (again, useful for when you use another LiPo to charge off of), check how many Watts are being drawn and output, and even see the internal resistance for each cell in 0.01 mOhm resolution. This is a very welcome feature that one wouldn’t expect in such a small field charger, but it helps a lot to spot bad cells in a larger pack. It’s also easy to tell when you use the storage or discharge modes: The top part of the screen will turn lavender for storage charge (with the voltage also being selectable), and purple when discharging. Don’t want to connect a balance connector? Don’t worry, the SC-608 will let you do that – but not without warning you first. 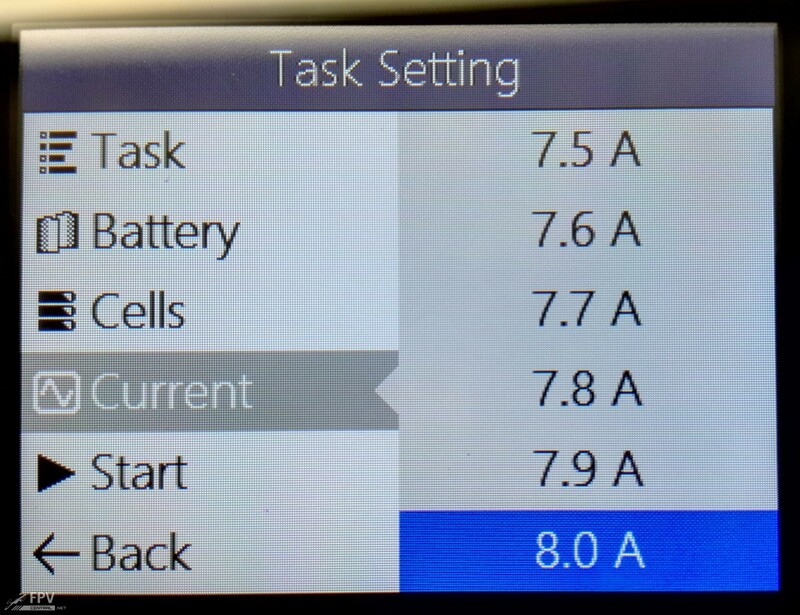 It also refuses to charge if it isn’t sure whether the battery cell count is correct. 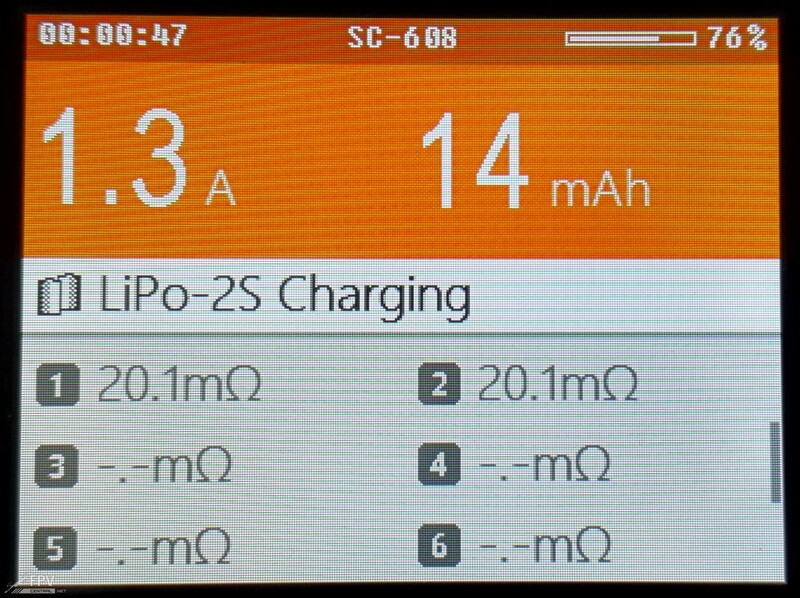 For example, a chock-full 2S LiPo made the charger unsure if we didn’t accidentally connect a really empty 3S battery. This may sound like an inconvenience, but better safe than sorry. 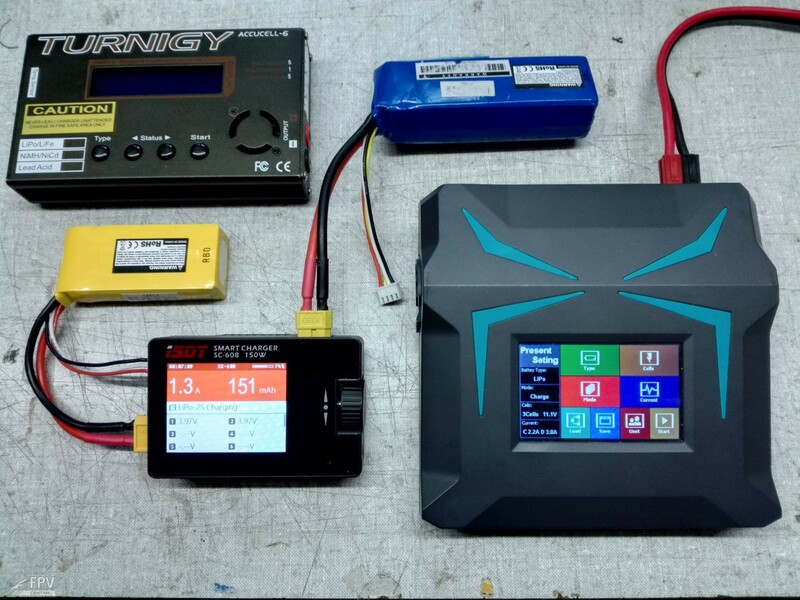 And in the charger’s defense, even our Pulsar charger sometimes won’t even start charging a completely charged battery out of fear of a wrong cell count. 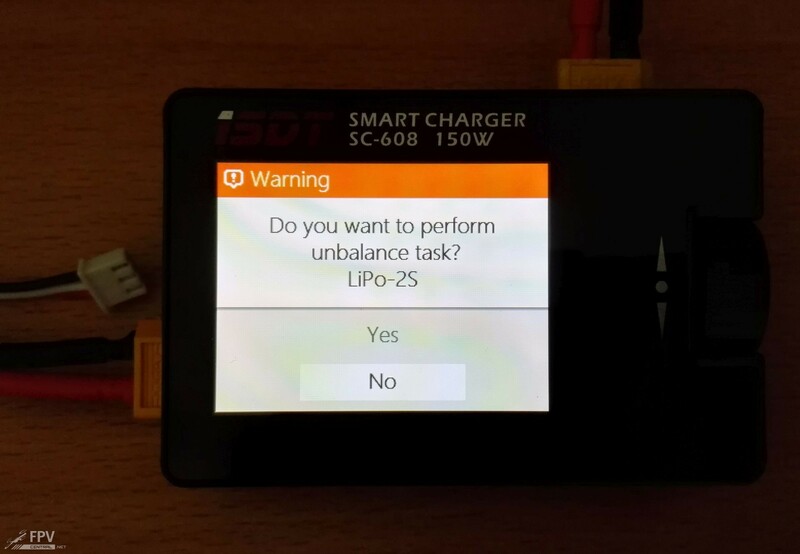 Note that this is a non-issue anyway, since you’re not likely to charge a full battery, and plugging in the balance connector removes all doubt. 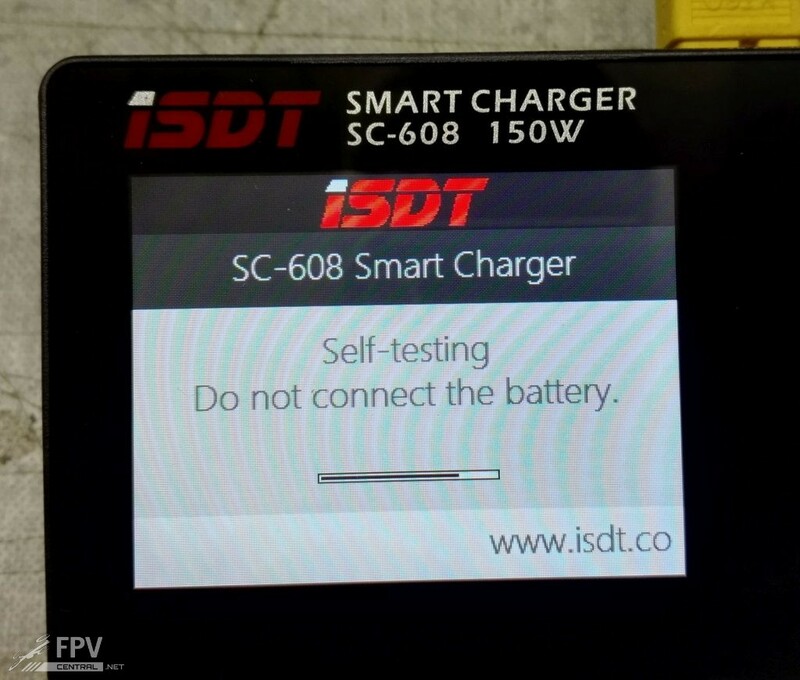 This is not a negative point about the charger, this is iSDT making the safe choice when unsure. 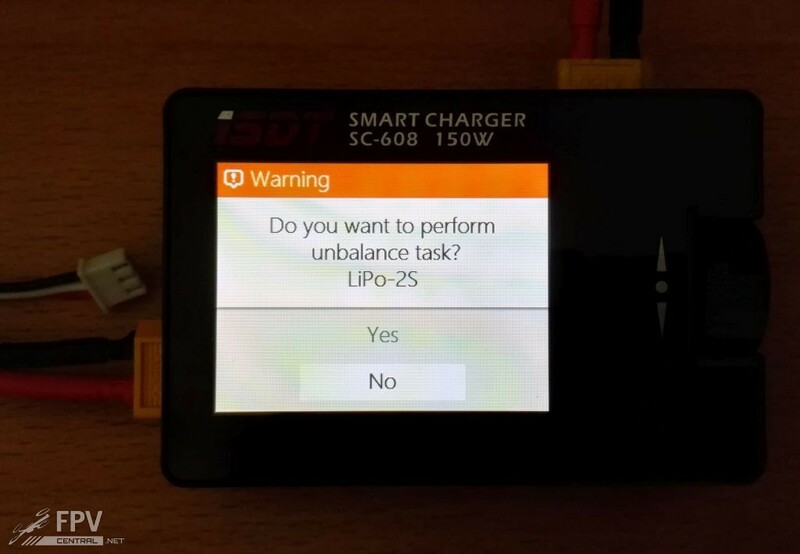 Balancing works reasonably fast, with the maximum balance current of 500mA per cell being above average, though it should be said that Pulsar’s standalone balancer goes up to 750mA, while the Orbit Microcharger Balancer can manage even 1A per cell. Still 500mA is way better than the 200mA that most chargers are limited to. Not a problem when you have a healthy pack, but it can be an issue if you’re trying to fix a problem battery. The balancer is active even after the charge finished, so you might want to leave the battery connected after the charge if you want the cells to be really equalized. What we really liked is that the screen updates immediately whenever you connect something – for example, plugging in a battery gives you the total voltage right away, plugging in a balance connector gives you the individual cell voltages without any delay, even when the charge is finished the active balance current is shown on the screen. Everything feels immediate and confidence-inspiring. Is there nothing this charger can’t do? Well yes, it can’t deter fingerprints. The screen surface is glossy, which isn’t ideal in sunlight and attracts fingerprints. The screen cover is plastic so scratches are inevitable, and disassembly requires removing the screen cover – a messy operation. Also, the balancer accuracy was only acceptable, with a maximum difference of 0.01V across a pack. 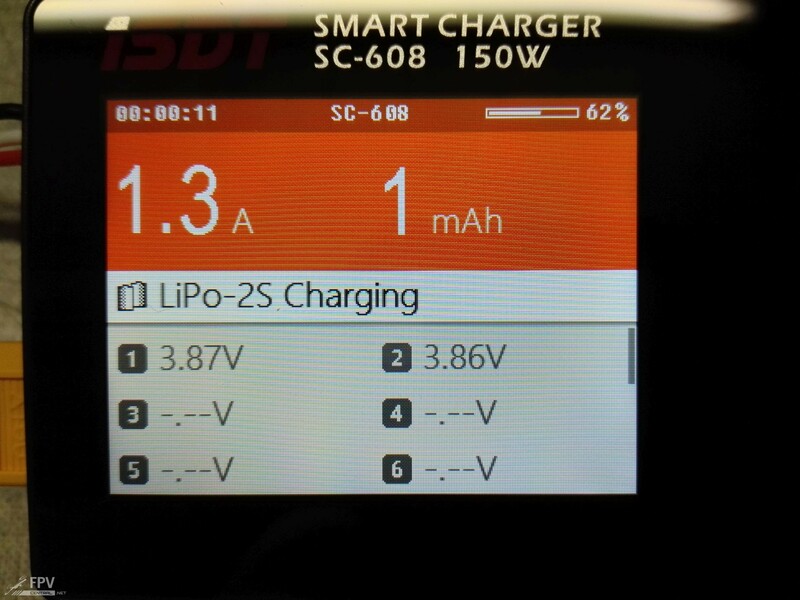 This means you could have a 2S lipo with one cell at 4.204V, and the other at 4.196V. 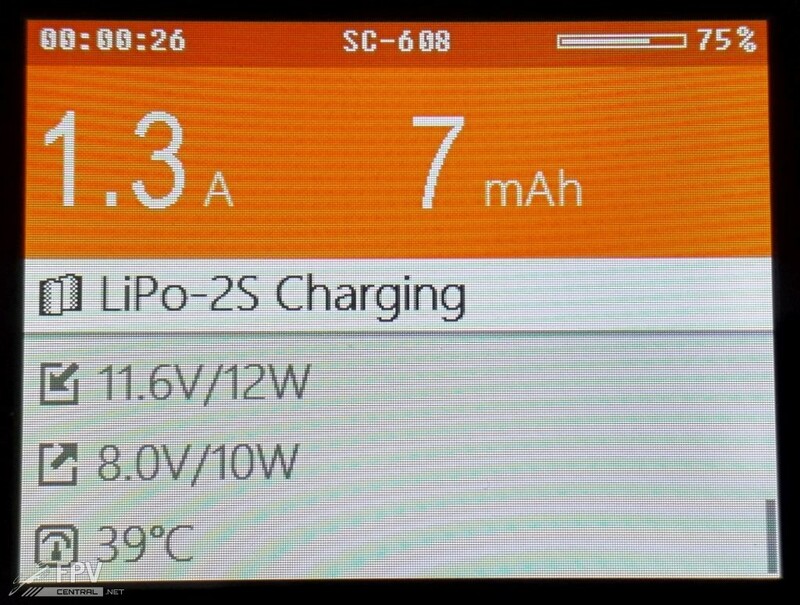 That is with the charger’s own screen showing 4.20V across the board. Not a big problem, but there’s definitely more accurate balancers out there. 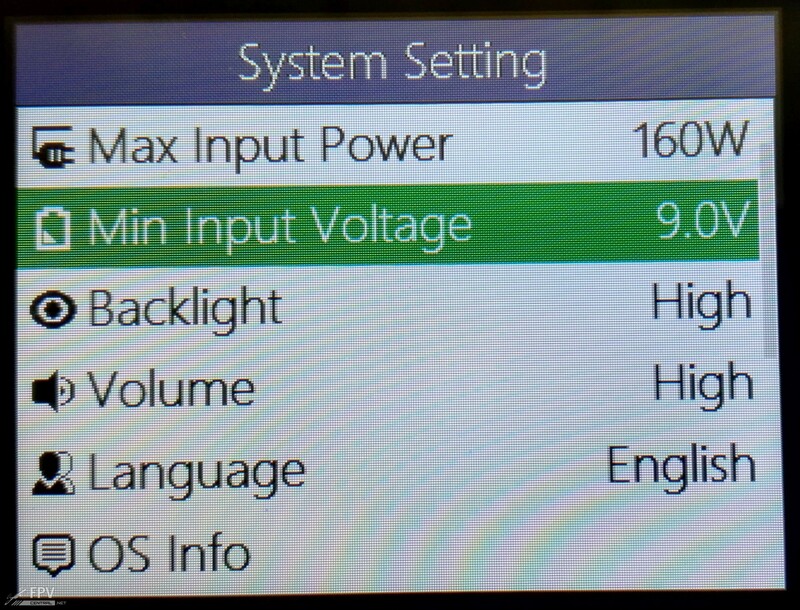 Another notable omission is the lack of presets for battery settings. Everytime you want to charge a different type of battery, you have to set the cell count and charge current. There’s no way to store settings in an easy-to-recall save slot or similar. However, it’s clear that iSDT prefered to streamline the battery settings interface to the point where a separate preset system does feel unnecessary. Someday someone will figure out that you could slap RFID tags onto battery packs and have the charger read the cell count and charge current wirelessly – but until that day, this charger works well enough even without a means to recall commonly used battery settings. The iSDT SC-608 is an almost-perfect field charger. 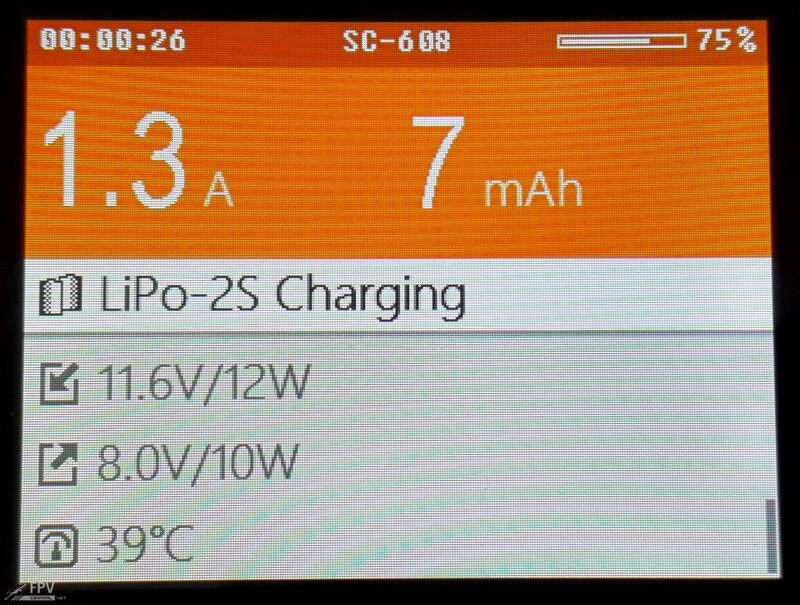 While some may bemoan the lack of 220V input, that’s not what this charger is for. This little device is meant to be used with a big LiPo as power source, in the field. Adding a power supply would’ve sacrificed this portability. If you already use XT-60 connectors then this is a must have, it’s going to reduce the bulk you have to lug to the field considerably. This charger will definitely replace the X-100 we’ve been using as a daily driver so far, as the iSDT is not only smaller, but more powerful (true 150W instead of just barely 100W). Even the Accucell-6 can’t hope to compete with just 50W and an input voltage range of 11V to just 17V. 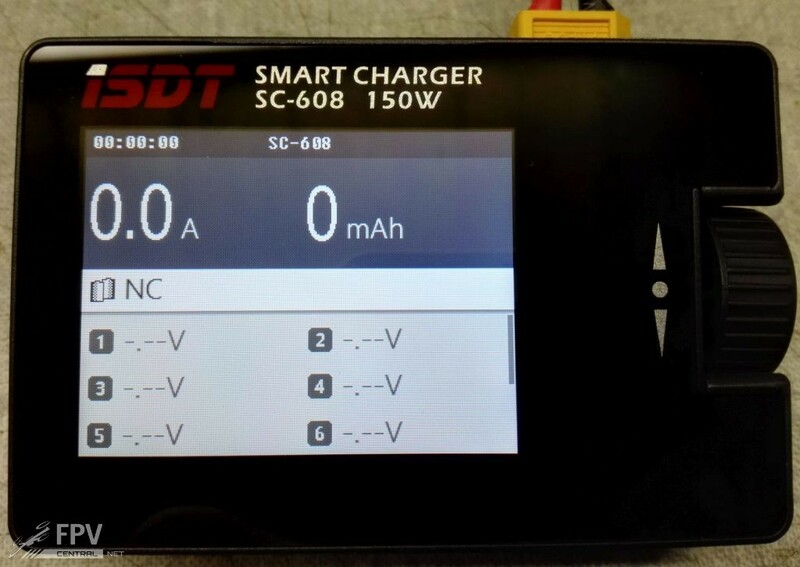 And if 150W is not enough for you, iSDT also have a 500W model called the SC-620 which costs just around 30$ more. The only drawbacks are the average balancer accuracy and the glossy screen cover. If you think you can live with these minor blemishes, this is the ultimate field charger. You can calibrate the balance and the overall voltages. 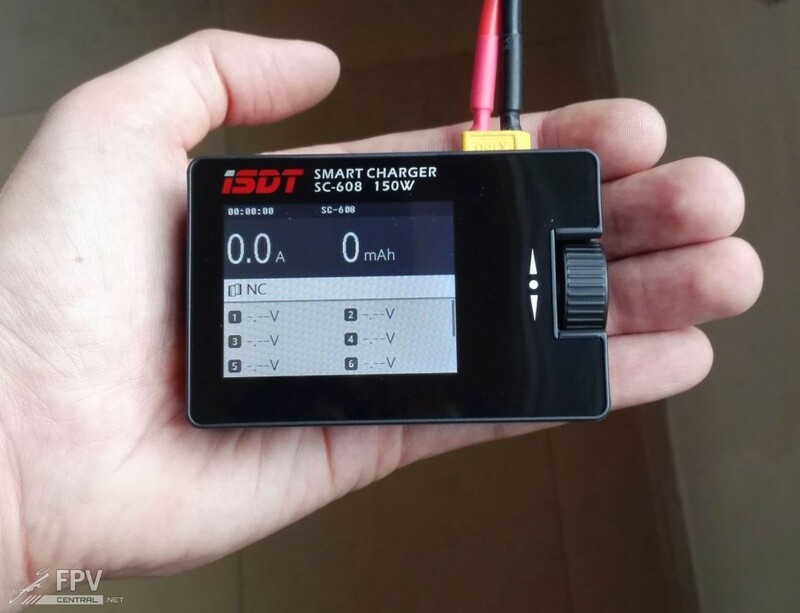 You just have to update the Firmware to one of the recent ones and send ISDT an email that you want to do that with the PN number of your charger. They sent you an “unlock” code back with the instructions how to use it. But be carefull, you should have reasonably good and calibrated Voltagereference sources and/or calibrated Voltage meters if you want to do that.